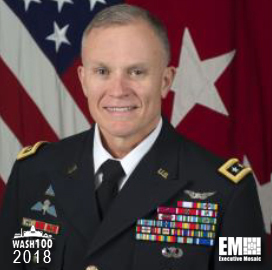 Executive Mosaic is honored to unveil Army Lt. Gen. Robert Ashley, director of the Defense Intelligence Agency, as the newest inductee into Wash100 — Executive Mosaic’s annual selection of influential leaders in the government contracting arena–for his efforts in open-source intelligence and expertise on counter-terrorism operations. Ashley became the 21st DIA director in August following his Senate confirmation for the post. In this role, he oversees the agency’s workforce of 16,500 employees who provide intelligence on foreign militaries and operating environments. Four months prior to his appointment, he said the service branch had initiated a “bottom-up” review of the entire force to assess the Army’s current capacity and mission requirements across several areas such as open-source intelligence, counterintelligence and the integration of electronic warfare, cyber and signals intelligence. “It’s really targeted on what are the missions that are emerging now that we have not really accounted for and where are we going to be in 2025,” Ashley said of the review at the Association of the U.S. Army breakfast event in April. He previously served as the Army’s deputy chief of staff, G2, and was senior adviser to the Army secretary and the service’s chief of staff on security, intelligence and counterintelligence matters. He also held the roles of director of intelligence at the Army Joint Special Operations Command and the U.S. Central Command and commanding general of the Army Intelligence Center of Excellence at Fort Huachuca in Arizona. Ashley is a recipient of several awards that include the Defense Superior Service Medal, Bronze Star Medal and the Legion of Merit. Executive Mosaic congratulates Robert Ashley and the Defense Intelligence Agency for their selection to receive the award.